Here’s a fun movie deal! Through 7/30, Amazon Underground is offering a $5 off a movie ticket from Fandango when you download the Fandango App from Amazon Underground. To get this deal, download the Amazon Underground App on your Android device, click the “apps and games” section and then download the Fandango app. 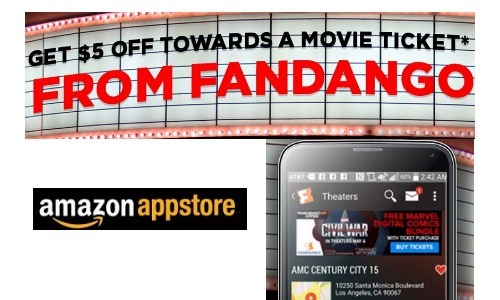 Allow 24 hours for your Fandango Promotional Code to be delivered to the email associated with your Amazon account. Limit (1) code per customer. Must be redeemed by 8/14.